Facebook has begun deleting fake page "likes", independent data suggests. According to Pagedata, many of the site's most "liked" pages suffered large drops in numbers on Wednesday. The move follows the social network's admission that 8.7% of its users are not "real", many having been set up by spammers who use them to artificially make pages appear more popular. The issue poses a problem for Facebook as it seeks to expand its targeted advertising service. 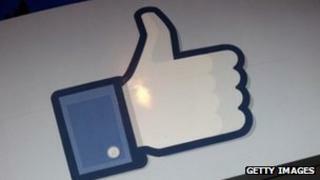 Facebook's shares have slumped from their initial public offering of $38 (£23) in May to $20.62 on Thursday. In a blog post written in August, Facebook said: "A 'like' that doesn't come from someone truly interested in connecting with a page benefits no-one." Technology news site The Verge, citing Pagedata's statistics, noted that some of the most popular pages on Facebook had suddenly shed significant numbers of users. The page for Texas HoldEm Poker, one of the site's most popular, shed 96,317 "likes" on Wednesday - compared with net gains of about 20,000 each day for the previous month. Other prominent pages also saw a drop in numbers, including those of pop singers Rihanna (-28,275), Eminem (-15,420) and Lady Gaga (-34,326). Facebook would not confirm to the BBC that the purge was happening, but could not provide an alternative explanation for the drop in numbers. Earlier this year, an investigation by BBC technology correspondent Rory Cellan-Jones highlighted some shortcomings in Facebook's "like" system. His fake company, Virtual Bagel, which used Facebook's targeted advertising programme, attracted more than 1,600 "likes" - despite having neither products nor interesting content. Closer inspection revealed these had come from accounts in countries such as India, Egypt, Indonesia and the Philippines. Marketing experts argued that had Virtual Bagel been a real company, using Facebook advertising to gain these likes would have been a waste of money. At the time, Facebook told the BBC that there was no "significant" problem. But later, a blog post announced an impending crack-down on illegitimate activity. Facebook reassured users that impact would be minimal. "On average, less than 1% of 'likes' on any given page will be removed, providing they and their affiliates have been abiding by our terms," the company said. "These newly improved automated efforts will remove those 'likes' gained by malware, compromised accounts, deceived users, or purchased bulk 'likes'. "While we have always had dedicated protections against each of these threats on Facebook, these improved systems have been specifically configured to identify and take action against suspicious 'likes'." The aim of the tweaks was to provide "more accurate measurement of fan count and demographics" to brands that use the service to advertise their products or services. Promoting online engagement with brands is a key component of Facebook's business model, in which it uses key information - such as age, gender and location - to target certain advertisements at specific recipients. However, this system is increasingly coming under threat from a black market of fake "likes", sold in bulk in order to falsely boost a brand's figures. A simple search brings up a host of websites offering large numbers of Facebook fans or "likes" - as well as followers on Twitter and views on YouTube.